During some random surfing on the net, we suddenly came across these master pieces of the celebrated French impressionist painter Claude Monet. 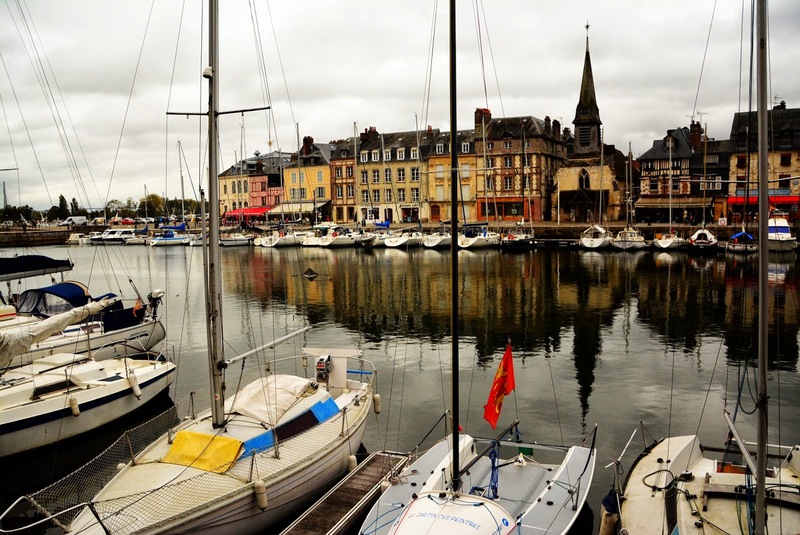 The paintings were so impressive that we could not resist making a detailed search on their location, and thus we stumbled upon the quaint port of Honfleur. The first thing that pleased us was that it was not far from Paris and thus was ideal for a weekend trip. Honfleur is a port on the left bank of the estuary of the Seine. We had already visited the estuary of the Seine at Le Havre. Honfleur on the other hand is much smaller and picturesque than the busy modern port of Le Havre. Though 'fleur' in French means flower, the 'fleur' in Honfleur signifies the branching of the Seine into the sea. However Honfleur is no less than a graceful flower in the bouquet of beautiful towns dotting the Norman coast of France. 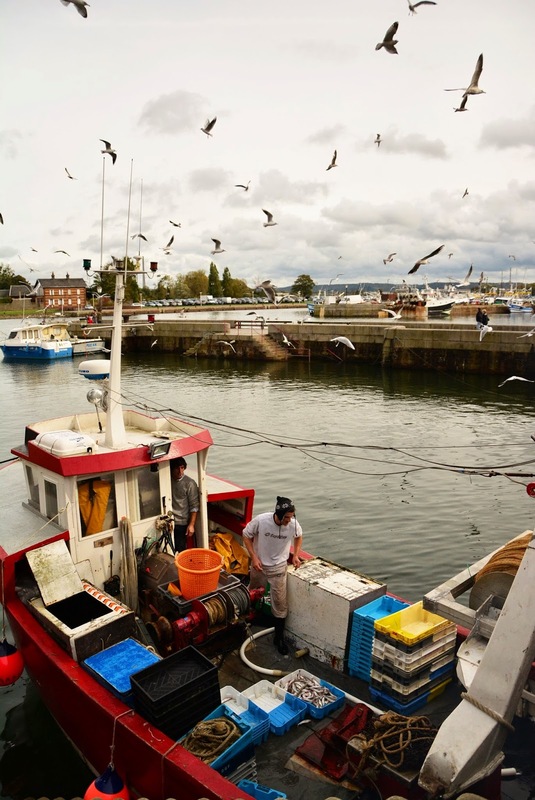 Because of its strategic location on the mouth of the Seine, Honfleur has benefited through out history from maritime trade and more significantly from trading of wood in the 19th century. Though the trading tradition is now overshadowed by the more affluent Le Havre the maritime charm is still intact in Honfleur. Mitra had a conference at Dijon, and he returned to Paris on Wednesday, the 30th of October. After a presentation at the conference he was surely entitled to take the rest of the week off and thus we left for Honfleur on Thursday. We took the train from Paris Saint Lazare station quite early in the morning. Honfleur does not have a train station and the nearest one can get by train is either to Deauville or Le Havre and it takes around 2 hours for both from Paris. We took the former option and reached Deauville at around 10 in the morning. Honfleur lies on the bus route from Deauville to Le Havre and the buses are operated by the Bus Vert of Calvados. It takes about quarter of an hour to reach Honfleur from Deauville and there is one bus roughly every hour. Thus we finally reached Honfleur just before midday. Suddenly I recalled a show that I loved as a teenager when I was in India called "Musafir Hoon Yaaron" and an episode which featured this region. After a few searches on YouTube I stumbled upon the Episode 47 of the show and I must say that it helped us to plan the trip. I found out that the show was televised in 2005 and was amazed to find that hardly much has changed over the last 9 years, in this quaint little place far away from all the hustle bustles of daily life. As soon as we arrived here, we were enticed by the charming little port of Honfleur and the colorful houses bordering it. 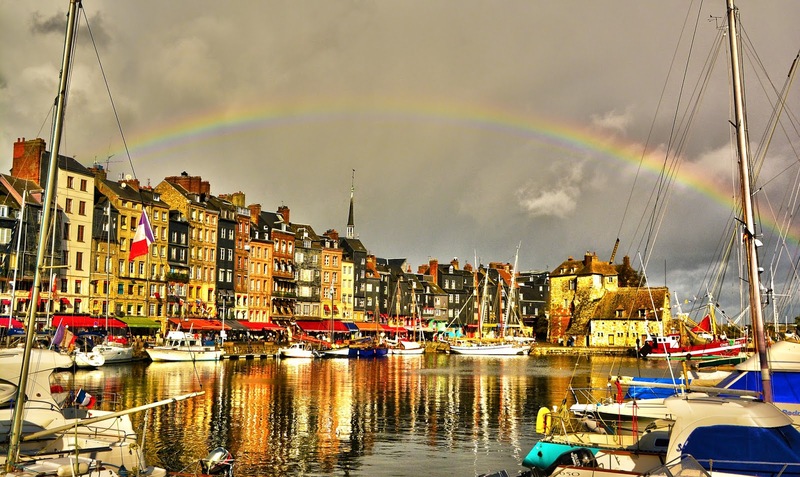 Honfleur is in the Normandy region of France, and in this region the skies are as generous with the rains as the people with their good quality of milk. Thus to protect the wooden houses from the rains, they were covered with chalk from the cliffs bordering the coast of Normandy. The chalk facades turns the old port into a canvas with the paints on them making Honfleur resemble a beautiful impressionist painting. This particular aspect of Honfleur and the views of the sea front, the jetties and the quays of the city since the 1830s has attracted numerous painter. 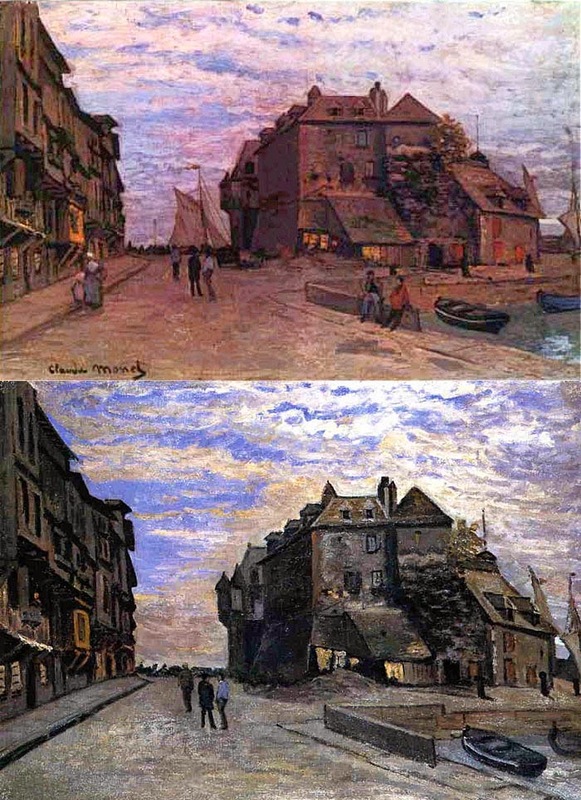 Charles Mozin exhibited a painting of Honfleur at the 1844 Paris salon which inspired many artists including some of the famous painters such as Gustave Courbet, Eugène Boudin, Claude Monet and Johan Jongkind. Thus was born the Ecole de Honfleur (Honfleur school) which contributed to the appearance of the Impressionist movement. Today the entire city of Honfleur can be termed as an art gallery with painters and their ateliers lining almost every street and corner of this picturesque port. 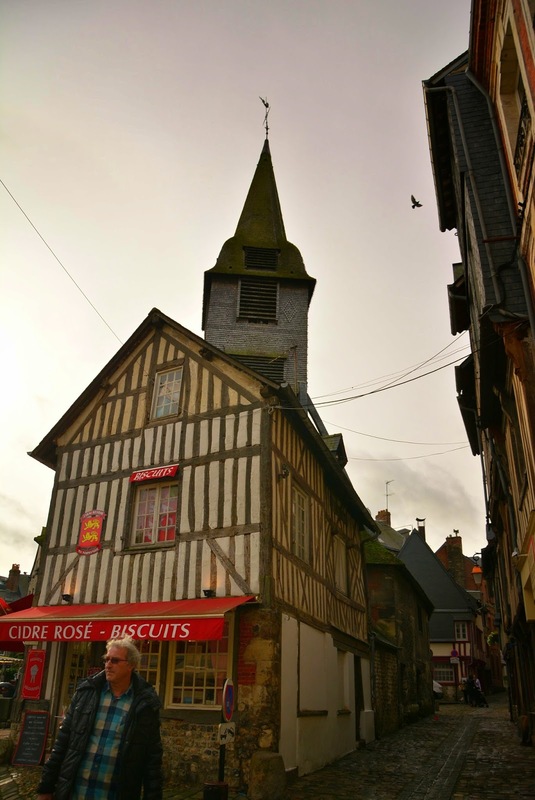 Honfleur can also boast of the largest wooden church of France, the church dedicated to Saint Catherine of Alexandria. Its towering bell tower separate from the church is a marvel of 15th century Gothic wooden structure. Honfleur's oldest church Église Saint-Étienne is now a museum that holds some of the little secrets of this charming port city. In the evening we took a walk along the bank of the Seine and here one can find the last bridge on the Seine before it pours itself into the English Chanel. The Pont de Normandie is the longest bridge on the Seine and was the longest cable-stayed bridge in the world when it was completed in 1995. We were in search of the beach of Honfleur which was marked on the tourist map, but of course it is better to stroll around the beautiful port than walking about 3km in the quest of the beach. We realized this the hard way though when a gust of heavy downpour suddenly rolled over us and drenched us completely within just a span of 10-15 minutes, shattering our umbrella on the way. During our stay in Netherlands we had realized that umbrellas are not a solution in these parts of the world and one should prepare by other possible methods or be prepared to take a outdoor shower during the really frequent downpours. In the 17th century the port benefited largely from the maritime activities directed towards the French colonies and it was from here that Samuel de Champlain sailed to settle the colony of New France which later came to be known as Quebec. This feat is marked by a plaque on the lieutenancy building which served as the former home of the Governor of Honfleur and the painting of which by Claude Monet attracted me to this lovely haven. Honfleur was also the home of one of the first landscape painters to paint outdoors, Eugène Boudin. His old mansion is now a museum which holds some of his master pieces and other great pieces of art from the impressionist era. Erik Satie, the French composer and pianist and a prominent figure in the early 20th century Parisian avant-garde was born here and his house is now open to public as a museum. Apart from them one can find houses scattered around Honfleur with plaques depicted names of various famous and less famous artists and painters who have either lived or were born in Honfleur. Owing to the rolling countryside typified by pasture for dairy cattle and apple orchards, Normandy excels the rest of France for its dairy products and its cider. The Norman cow claimed to have descended from cattle imported by the Viking settlers is quite popular for its rich thick milk which is used to make some famous cheeses like Camembert, Livarot, Pont l'Évêque, Brillat-Savarin, Neufchâtel, Petit Suisse and Boursin. Thus thinking about calories is not something you do when you are in this part of the world. The best way to discover the finest of the local products is at the farmers' market. 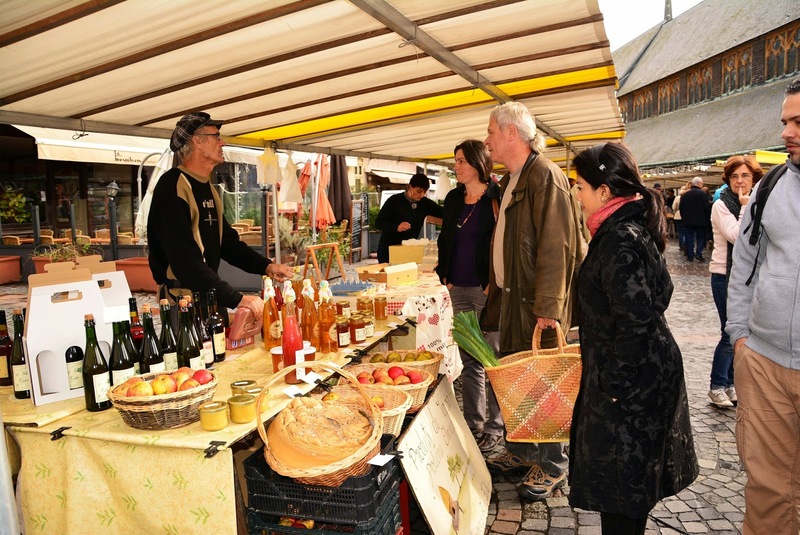 Farmers' markets occur in every commune of France on a specific day of the week, and here at Honfleur it takes place on Saturdays. At this markets you can also try out some of the products before buying them and we did try some locally produced honey and could not resist buying it. The markets are also filled with products derived from the famous cow such as cheese, fresh cream, butter and of course some cooked delicacies. If you are lucky to be at the dock at the right time, you may also see fishing boats returning with their fresh catch. Sea-gulls hovering over the dock in a flock signaled such an arrival and we rushed to the docks to see the sailor hurling out crates of shrimps and he started selling them right away. To our surprise the entire bunch was sold out in less than 10 minutes. Sea salt is another local product and one can find salts with various flavors such as apple or smoked wood. The cider is another thing that should not be missed when you are in Normandy and Honfleur happens to be in the department of Calvados, which in turn gives its name to the brandy made from apple cider. To know more about this drink we traveled to Pont l'Évêque, a village about 20 km inland from Honfleur to visit the distillery of one of the most reputed brands of Calvados, the Père Magloire. The bus from Honfleur to Pont l'Évêque is also operated by the Bus Vert of Calvados and it passes by the distillery which is located on the outskirts of the village. At the distillery we opted for a guided tour which costs around €10 per person and it includes a tour of the distillery, the cellars and some lessons how the brandy is aged and finally tasting of different types of Calvados and a rare variety of the drink and take home some memorable souvenirs of the distillery. 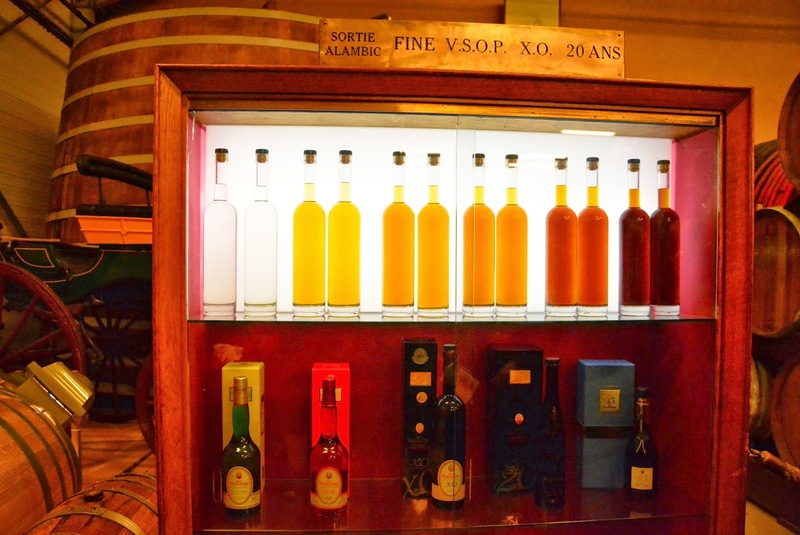 Calvados may be a bit strong for those that do not prefer hard liquers and for them there is always the sweet tasting delightful Pommeau which is made by mixing apple juice with Calvados. 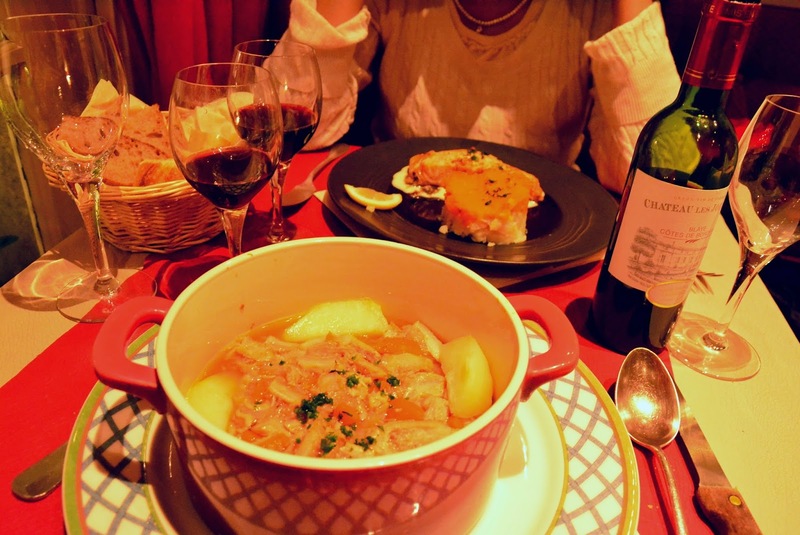 We discovered a good restaurant in Honfleur named the Auberge du Vieux Clocher and dined there all the three nights that we spent at the city. I am a devoted lover of salmon and to my delight we found a great salmon preparation here and I spend the three meals here devouring it. But of course Mitra did not resist trying some of the delicacies that this charming city has to offer. Being on the edge of the sea, the sea food cannot be missed and we did find some of the best oysters here at Honfleur. At the Auberge du Vieux Clocher we also tasted a delicious Chevre chaud au Miel (goat cheese with honey) which inspired me to try it out later at my place. Some other delicacies that we tried and should not be missed are the Poulet casserole (chicken in a thick cream sauce) and the Teurgoule (spiced rice pudding). Normandy is also known for the Tripes à la mode de Caen which is prepared from the edible offal from the stomachs of farm animals. Though it may sound a bit eerie but Mitra's expression showed that he really enjoyed the dish. The skies made up for all the rains we had during our stay with a rainbow adorning the beautiful port in the morning. Thus after four days of enjoying enjoying the norman rain, the rich food of this beautiful picturesque port and tasting apple brandy, after strolling lazily along the Seine and getting lost in the winding lanes of the city and its historical buildings, after admiring the graceful landscape with its colored facades that were captured many a times by artists and impressionists it was time to return to Paris with the impression of this quaint port in our minds.